HomeLive ReportingPoker ToursWSOP2010 World Series of PokerEvent #37: $3,000 H.O.R.S.E. We started out today with 25 world-class mixed games players and although we knew we were in for a long day, you had a feeling that today was going to bring something very special. Of course when you come back for a day three with superstars like David Benyamine, John Juanda, Jeff Lisandro, Dan Heimiller, Chad Brown, David Singer and several other previous bracelet winners, we were destined for a final table for the ages. When the field was reduced to 16 players, Phil Ivey was the short stack of the field. 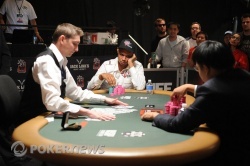 By the time the final table was formed, Ivey was amongst the leaders and looking in control. However Ivey never had it easy and his chip stack fluctuated as the going was tough against such a strong lineup. We've witnessed Ivey destroy final tables in the past, but you never got the feeling that this title was his, until he got heads up. Bill Chen put up a great fight and excelled on the final table, but once Ivey got some momentum heads up, it seemed like there was only ever going to be one winner. That man is Phil Ivey. Bracelet number eight. It puts him in rare company with the elite in poker's history. Of course, bracelets mean a lot to Ivey, but the talk tomorrow will be about the side bets he stands to collect from this victory. In fact after it was all over, Ivey was overheard to comment, "So how much is it for first place anyway?" 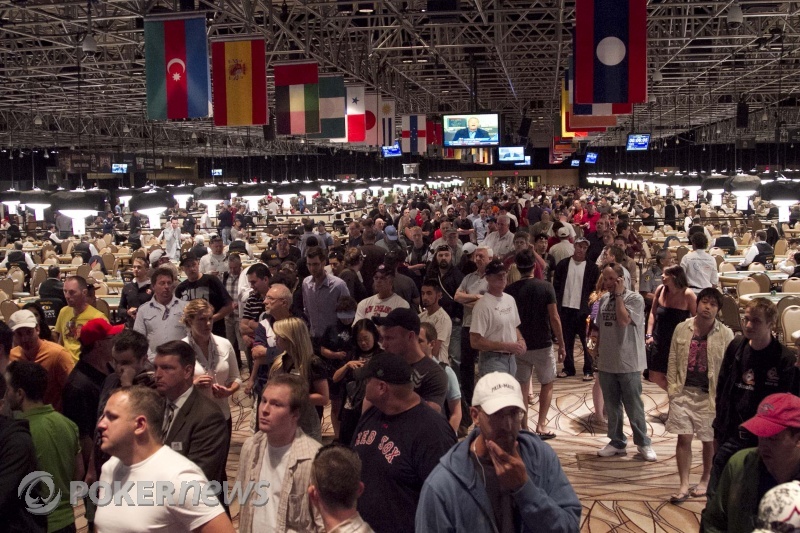 That's any day in the books from the WSOP, and it's one that will be forever remembered for the legendary Phil Ivey. Good night from the Rio! We thought we were on a five-minute razz siesta. Every previous round of razz in the heads-up portion of this match saw the high card bring it in, the low card complete, and the high card fold. In fact, on the first hand of razz this round, Phil Ivey brought it in and just immediately passed the bring-in chips to Bill Chen rather than wait for Chen to complete. On the final hand of the tournament, Chen brought it in with a deuce and Ivey completed an ace. Chen then raised and Ivey re-raised. That's where Chen stopped and motioned to TD Bob Smith. "I have a question," said Chen. "How many raises are we allowed?" "Heads-up, as many as you like," Smith replied. Chen then put in the next raise, which Ivey just called. Improbably, each player started three to a wheel and made a strong low in 5. Ivey's was stronger and left Chen looking for a 3 just to chop the pot. Each player drew a 7 on sixth street, no help. Down the river, Chen pulled a 10, which was no help. Ivey, because he's Ivey, obviously pulled an unnecessary 4 to end the tournament in style with a wheel. Chen leaves in 2nd place with $203,802 in prize money. Bill Chen raised his button and was called by Phil Ivey. Ivey check-raised a flop, then took the pot down with a bet on the turn. Chen is back down to less than a million. He's got 950,000. This has been a long, steady march for Ivey but it seems like he's closing in on his eighth bracelet unless things drastically change for Bill Chen. After a couple of chopped pots, Phil Ivey raised the button and Bill Chen called. Chen check-called a bet on a flop of , but when Ivey fired again on the turn, Chen surrendered. He's down to 1.25 million now. Even at this stage of the tournament, being quartered happens. Bill Chen raised his button and Phil Ivey called. Ivey check-raised a flop of , with Bill Chen calling. Ivey then went into check-call mode, check-calling the turn and river. Each player made the same straight for high, but Chen got the low with to Ivey's . Chen is still down in the match with 1.5 million in chips. Bill Chen raised the button, with Phil Ivey calling from the big blind. Ivey then led into Chen on a flop of and the turn. Chen called the first bet, but on the turn he put in a raise. Ivey called that raise to see the fall on the river. He checked to Chen, then put in a check-raise after Chen bet. Chen decided not to call, folding his hand and slipping to 1.1 million in the process. The chip lead is changing almost every hand now. If Phil Ivey wins a pot, he grabs the lead. 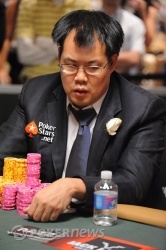 If Bill Chen wins a pot, he grabs the lead. After a few small hold'em pots, Bill Chen has 1.9 million and Phil Ivey has 2.4 million chips. Phil Ivey, Jack Binon, Jack Effel. 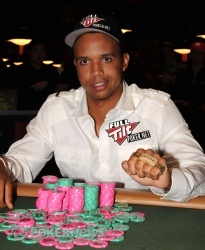 Phil Ivey along side Jack Binon.